Editor’s note: this article was written by Casey Hampton, but an issue with his account led me to just post it under my name. 1) Bottle Up Benny: Benny Snell Jr. is arguably one of the best running backs in the SEC. Last season, he totaled for 1,333 yards on 262 attempts for an average of 5.1 yards per carry. He can also be a receiving threat too, with 72 yards on 10 attempts in the air. Last week against Central Michigan, Snell accounted for 125 yards on 20 carries with two touchdowns. He’s eclectic with the ball, and rightfully should be respected by SEC defenses. Honestly, this is the one factor that I think could make this a scary day for Gator fans. Snell was a thorn in the Gators’ side last year, accounting for 81 yards in his freshman debut—and like a fine wine, he gets better with age. The Gator linebackers need to be aware of his movements and bottle him up and dare Wildcats QB Terry Wilson to throw the ball. 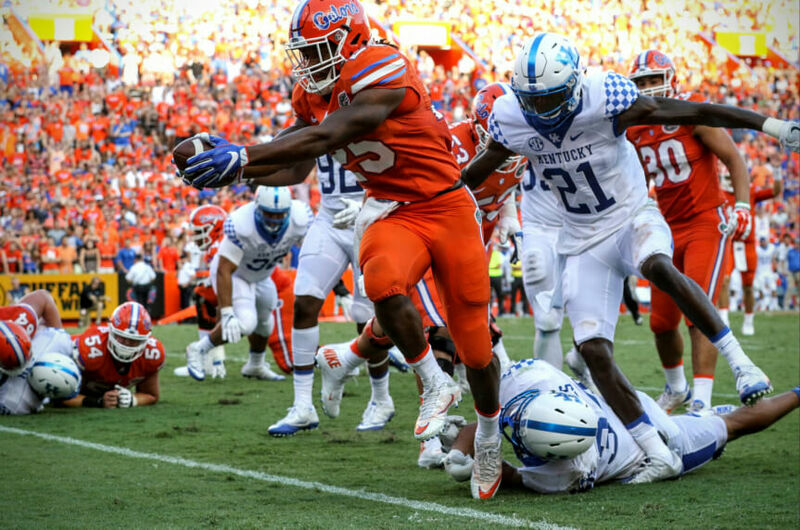 2) Fumbles: Kentucky fumbled the fall five times and finished with four turnovers last week against Central Michiogan, which should be music to the Gators’ ears. The defense needs to be opportunistic and have as many clean takeaways as possible to keep the Gators in control of this game. I worry about such a young and newly coached team like Florida falling behind early, so the defense being on its toes (hopefully with David Reese and CeCe Jefferson back in the lineup) will definitely be key to staying in and controlling this game. 3) QB play: I know, I know—queue the broken record. But, for real—Felipe Franks doesn’t need to have the type of night he had last week against Charleston Southern with five touchdown passes, but he does need to make smart plays, have clean reads downfield, and keep the goose egg next to his stat line in the INT category. Simply, he doesn’t need to be a Heisman candidate, but he does need to manage the game well, have sustained drives, and protect the ball. 4) Third Downs: A common refrain of the Jim McElwain era was the inability for the Gators to convert on third down. In fact, the Gators only converted 41% of their third down’s in 2016 and went even lower than that to 35% last season. In the season opener, the Gators had 25 first downs—but that stat us somewhat misleading. The Gators converted on only 2 of 9 third downs. I’m not sure whether that can be attributed to the amount of yards, big plays, or if first or second team was out there—but as SEC play begins, that number has GOT to improve. Keep an eye on that number during the Kentucky game. We’ve seen this song and dance before—a good defense gassed by the middle of the fourth quarter because the offense can’t stay on the field. 5) Real time: Yes, this is Kentucky. Yes, the Gators are 14 point favorites (as of this writing). And yes, the Swamp will be rocking for a game under the lights. But, let’s see what the Gators put on the field for an encore of last week. Kentucky is undoubtedly better than Charleston Southern, and has given the Gators fits in recent years (2016 excluded). Franks was pulled from last year’s game after a subpar outing in favor of now-graduated Luke del Rio. There’s nowhere to hide for Franks this time around, and there’s no one with real SEC game experience to bail him out. Same goes for many positions on the Florida roster. It’s time for the Gators to step up and assert that they are for real. Maybe not winning the national championship (yet…) real, but that they are not the pushover they were last year, and their players believe in what Dan Mullen is selling. This team—offense, defense, and special teams—all need to show out and play through the whistle. No missed assignments on the line (I’m looking at you, Martez Ivey), no sloppy tackling (I’m looking at you, Chauncey Gardner-Johnson), and solid runs after contact (I’m looking at you, Jordan Scarlett and Malik Davis). This can be a statement game if the Gators want it to be—even if it’s just Kentucky. Because now, it’s for real. Let’s see what the Gators do. Good review. I think our D-line and Bucks feast tomorrow.